• More than 50 General Directors of the Geological Surveys of 20 Latin American countries and 34 European countries, together with the United States and Canada, will gather in Madrid from the 19th to the 23rd October to explore new ways of cooperation. 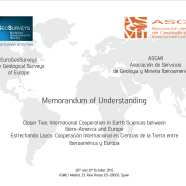 • EuroGeoSurveys, the Geological Surveys of Europe, and the Association of Geological and Mining Surveys of Ibero-America (ASGMI), will celebrate the Annual Assembly at IGME Headquarters. IGME is member of both organizations and will host the meeting. This combination of national geological organizations of both continents has never happened before, therefore representing a historically relevant fact. • EGS and ASGMI will share a joint two day-workshop titled “Closer Ties: International Cooperation in Earth Sciences between Ibero-America and Europe” and will sign, for the first time in history, a collaboration agreement that will involve more than 14.000 professionals working within the members of the both organizations, which joint budgets will reach 1.500M€. • The World Bank and the European Commission (Directorate General for Internal Market, Industry, Entrepreneurship and SMEs and Directorate General for Development and Cooperation) will contribute with proposals for financing the Earth Sciences cooperation between the two sides of Atlantic. The Workshop (that will be held in English and Spanish with simultaneous translation at the Gomez Pardo Foundation c/Alenza no. 1 on the 20th and 21st October) will be inaugurated by Marina Villegas, Director General of Technical and Scientific Research of the Ministry of Economy and Competitiveness, together with Jorge Civis, IGME Director, Santiago J. Muñoz Tapia, ASGMI President, and Koen Verbruggen, EGS President. The Workshop will focus on geological risks, mining and environmental conflicts, as well as institutional strengthening, for which will be studied possible European and international sources of financing projects thanks to the presence of Mattia Pellegrini, Head of Unit for Raw Materials, Metals, Minerals and Forest-based Industries, Jean-Paul Joulia, Head of Regional Programme for Latin America and Caribbean of DG DEVCO, as well as Francisco Igualada, expert in Mining, Energy and Extractive Industries at the World Bank. The Closing of the event will include the signature of the Memorandum of Understanding between EGS and ASGMI, which will involve more than 14.000 professionals working within the members of the both organizations, which joint budgets will reach 1.500M€. On Thursday the 22nd, a geological field trip has been organized in Segovia titled “Urban geology and natural risks inside the city of Segovia”, in which the Directors will find out, during a walking tour, the geology of one of the most touristy and gastronomic-famous of Spanish cities, all in the hands of local geologists, experts and scientists from the Instituto Geológico y Minero de España (IGME). They will see how the roman aqueduct, up to 30 metres high, experiences different contacts between Cambrian marbles, Ordovician gneiss, Carboniferous sandstones and Cretaceous granite and dolomite, and they will visit a middle age town built over a calcareous plateau, in which intertidal Cretaceous deposits crop (some of them inside a lingerie shop). They will be able to see a place where the human activities interfered with the geological process since more than 60,000 years, producing situations of natural risks and the exploitation of geological resources. The participants of the field trip will be welcomed at 11.30 by the Mayor of Segovia Dña Clara Luquero, in the ancient plenary hall of the City Hall, and they will continue at 12.00 with the visit of the extraordinary exposition Hispania Geologica Chartographia organized by IGME in the Fortress of Segovia, dealing with the history of geological maps in Spain.